SOPHIE LEROUX’S WALK across the Seine is one of the important early scenes in my new novel Finding Pegasus.The scene traces her walk across the Île de la Cité, home to Notre Dame Cathedral and the Sainte-Chapelle, to the quai on the Left Bank, where she and her young son Lucas witness the murder that’s central to the plot. This is a picture of that quai that I took a few months ago. Pont Neuf (which, despite its name, is the oldest bridge in Paris) lies in the background. Sophie is the late-life daughter of a World War Two associate of General de Gaulle. She inherited her father’s apartment overlooking the Seine (in fact, just to the left at the end of the Pont Neuf). She makes friends easily and has a smart and charming young son, Lucas, who she is walking home across the Seine. Lucas witnesses a murder that sets up the entire plot of the book. 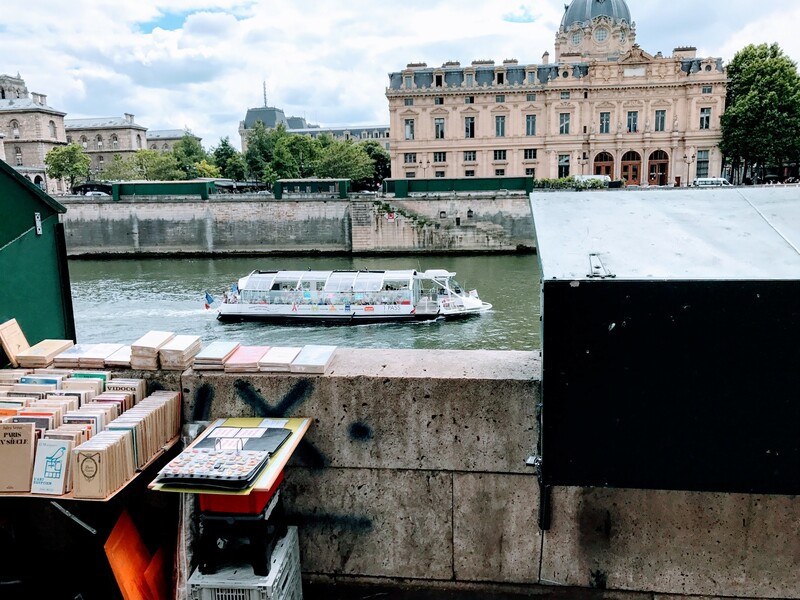 On the far side of the Seine, where Sophie waits for Lucas to arrive on the bus, she stands at the stone rampart next to the green box from which a bouquiniste sells books, smoking. Seine cruise boat headed up the river as seen from the Right Bank. In the background is the Quai des Orfèvres, the unofficial name for the old police headquarters, which recently moved out of the center city.